This post was originally published by AltruVistas. The following is an interview with Marilyn Borchardt, who has worked with Food First for over 30 years. Hi Marilyn! Can you share with us your knowledge of the global food sovereignty movement? Sure. A good definition for food sovereignty might be “the ability of communities to determine for themselves what they grow and eat, and the methods by which they grow it.” Food sovereignty focuses on sustainable, localized networks of cooperation and exchange, farmer-to-farmer movements, and seed exchanges. It’s largely a non-commercial and organic movement. The concept was developed by La Via Campesina, an international organization that started in Europe, and whose directorship switches continents every couple of years. They’ve been very active in international forums like the UN, where they promote agroecology. International trade has not been a friend of small family farmers worldwide. It tends to put small farmers out of business, and radically changes the diet of the poor people in these countries—and not for the better. For example, quinoa became really popular in the West. Investors in Bolivia and Peru bought up land, then farmed it much more commercially than indigenous peoples have done for generations. Quinoa is one of the main protein sources for these indigenous communities, but now many have lost their land and are forced to buy cheap white bread in the store—so they’re no longer getting the balance found in their traditional diet and are suffering from malnutrition. Another example of the type of globalized agriculture food sovereignty movements are trying to combat is the dependency on pesticide use and GMOs. In Monsanto-heavy areas—for example, India— astronomical numbers of farmers have committed suicide after having bought into Monsanto’s system of raising cotton using the company’s combination packages of pesticides and patented GMO seeds. These methods require yearly input costs: more pesticides and new seeds. Frequently, the initial crop is a little bit better. But as we know, agriculture is weather-dependent. A bad season means these farmers can’t pay their loans back. So food sovereignty is about small farmers worldwide who are looking to feed their families sustainably. They might have a little extra to sell or trade, thus enabling their families’ education and health care needs. Control is localized and remains in the hands of the people who live on the land. In many parts of the world, these people are part of indigenous communities. In the US we might be more familiar with the term “food justice,” which is about inequity in access to food, and figuring out solutions to promote the opposite. Being hungry means you don’t have access to resources of land or money. Food justice often addresses income inequality and homelessness, and is about people having greater and more equitable access to resources. For example, the urban farming movement often intersects with food justice. Gardens are often used as a way of organizing people; but not enough space has been devoted by cities to really have them become huge food production sites. Also, you need a place to cook as well as grow. Can you talk about your experience on the Aloha Aina Hawaii journey, and what aspects of the food sovereignty movement you learned about in Oahu? I was really impressed by how much intergenerational education and knowledge preservation was going on in the movement in Hawaii. One place we visited, was run by adults, but all of the work was done by youth; they grew all of the vegetables and also sold them on the market in an entrepreneurial venture. 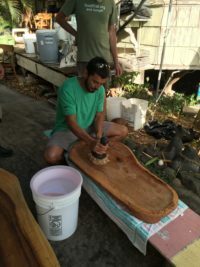 Albie Miles was instrumental in setting up a demonstration garden of all indigenous edible and medicinal plants at the University of Hawai’i – West O’ahu’s Sustainable Agriculture program. While we gardened at Ho’oula Aina Farm, nurses were also visiting, in order to learn more about native culture and the indigenous diet. And one of the educators at the poi-making demonstration we attended was also going around to schools and teaching young people how to make poi; he was preserving the cultural and root connection. 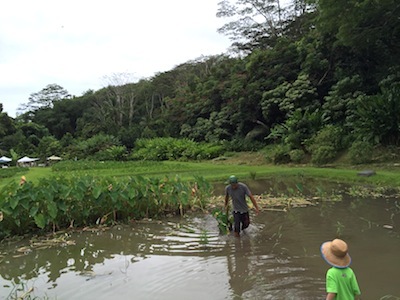 It was inspiring to be meeting constantly with Native Hawaiians who were working to recover their connections to the taro ponds, the poi, and the other foods they traditionally grew and ate. As for the challenges Hawaiians face: a lot of post-colonial Hawaii is leasehold land, so many people don’t know year-to-year whether they’ll have continued access to their land. This means it may not be wise to build any particularly intensive infrastructure. We also learned from Ashley Lukens, Program Director at Hawai’i Center for Food Safety, that a lot of the pesticide trials in the US are done in either Hawaii or Puerto Rico, and frequently near where people live or go to school. And of course there is “big ag” like Dole, running conventional plantations. And one third of the land in Hawaii is occupied by the U.S. military. One of the most interesting parts of our journey was the visit to the nonprofit Paepae o He’eia, which is dedicated to rebuilding and caring for a traditional fish pond. Pre-colonial family groups had strips of land down from the mountaintops to the ocean—so they had access to a diversity of biozones. Back then, the entire island was ringed by ponds that were constructed with lock and gate systems. The Hawaiians would net out the big fish for food, and let the little ones back out to the ocean. Only pieces of a few of these fisheries remain. The Native peoples we met with are determined to have greater sovereignty and control over their lives and resources. Going on this trip was inspiring, and built alliances and bridges. 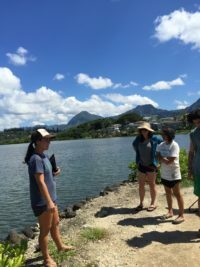 What would you like folks to know about Food First, since AltruVistas will be offering a membership and making a $50 donation on their behalf if they sign up for the Aloha Aina tour? Food First was started by Frances Moore Lappé, author of Diet for a Small Planet. When we started, no one was talking about food. Now, hundreds of organizations as well as university programs on food policy exist. 43 years later, Food First is still trying to drum in the message: We have an excess of food in the world! Farmers are having trouble making living because there’s too much food being produced. At same time we still have a large number of people starving. The root of that is the inequity that persists: As the rich get richer, the poor get poorer. 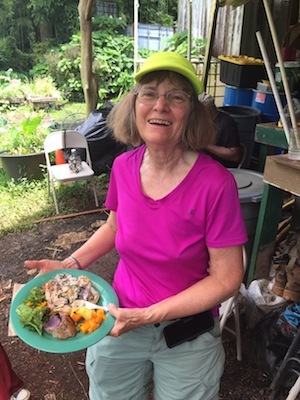 I was Food First’s development director for 30 years and in the last four months have been the interim director while the executive director is on sabbatical. We continue to research and publish books, and work with youth. We offer internships and also host a college-accredited IHP (International Honors Program), “Rethinking Food Security,” that starts in the Bay Area and takes students to three other countries to educate them about the global food sovereignty movement. We also cosponsor food sovereignty tours around the world in partnership with AltruVistas; the tours are a more intimate way of exposing people from the US and the West to the concept of food sovereignty. Professors, students, farmers, people who are interested in food and agroecology issues, and retirees who want to tour with a purpose have all come on our tours. As a Food First member, you’ll receive a quarterly mailing of our print publications, Food First News & Views and Backgrounder, and get the monthly “People Putting Food First” e-Newsletter. Pascal Bokar Thiam is a Jazz guitarist and vocalist of Senegalese and French background who teaches jazz and world music courses in San Francisco, CA.